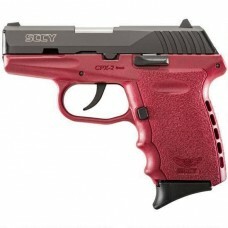 New "Generation 2" CPX is here - Now In-Stock! • Grip/Frame: Made from Zytel polymer, with ergonomic finger grooves and an integral "RE-COIL CUSHION" on the back-strap. • Recoil Spring System: all steel, fully encapsulated for ease of disassembly and reassembly. • 3 dot sight system: steel rear sight, adjustable for windage only with locking screw. • Hammer firing system: double action only, internal hammer with inertial firing pin to prevent accidental discharge if dropped. • Manual Guarded Safety: CPX-2 has NO manual safety.